This article originally appeared on Carokopp.com. I’d love to share why we chose not to scale support, and why we ask customers to email, tweet, or live-chat us each time instead. It’s very simple, and it’s a bit selfish. Simply, we don’t learn anything if customers finds the answers themselves on a forum or knowledge base. So, after the 5th time this question is asked, Company ABC might put it on a knowledge base. Then the next 50 people who have the question might find out themselves. They don’t have to wait for your customer service team to get back to them; they can find the answer at any hour. Right? At Buffer, in this example, we haven’t put it on a searchable forum. So, we are still answering the next 50 questions about this. That’s nearly one whole day for a Happiness Hero! That’s pretty darn expensive, especially when multiplied by every common question. This is often the exact math used to prove that knowledge forums are great. But, what happens next? And more importantly, what happens to the next 500 customers who have this question? Caveat 1: Enough executive support and budget to hire enough people to handle the first 55 questions in the first place. We are incredibly lucky to have a huge (huge!) amount of support from our CEO and COO. They believe in the value of having a large team devoted to customer happiness, and they allot a large part of our budget to paying this team well. 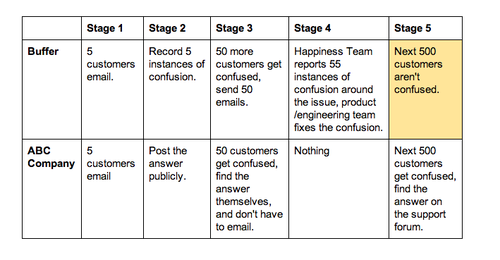 One third of the Buffer team is on the Happiness team. I recognize that this is an unusually generous percentage! We have a weekly meeting with our Product Manager, and together we prioritize every issue we brought him. He then assigns them so the engineers can tackle fixes. Caveat 3: The tools and time to keep track of all of these questions and areas of confusion.